Extraordinary engineers. Some birds have stunning plumage, some birds have complicated mating dances, but bowerbirds are creative engineers! To attract females, the males build, decorate, and maintain elaborate structures—the avian equivalent of bachelor pads—called bowers. These take many forms, but all are constructed with gathered twigs and objects like brightly colored stones, fresh flowers, or iridescent insect skeletons that are specially placed for the most impressive display. Although the regent bowerbird male is bright yellow and black, the female is a drab gray or dirty white in color. Bright as crayons. 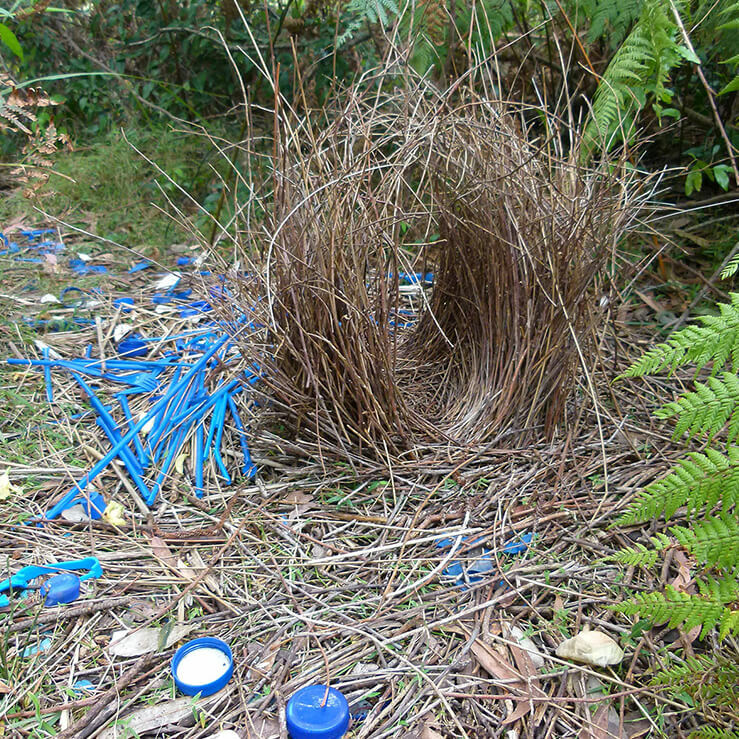 There are 20 different bowerbird species, and their plumage patterns vary dramatically. They show a wide variety of colors from green, orange, red, yellow, black, and white to olive-brown or sooty gray. Some have a brilliant crest of elongated feathers or even a ruff hanging over the back. Typically, bowerbird females are less flamboyantly feathered than the males. Bowerbirds are most numerous on the island of New Guinea in the South Pacific, but they are also found in specific areas of Australia. They occupy a range of different habitats, including tropical forests, mangroves, eucalyptus stands, and savanna woodlands. Chatterboxes. Bowerbirds have a wide range of vocalizations. Some utter loud, harsh notes or hiss, cackle, and chatter. The calls include mimicry of other birds species’ calls, sounds from their environment, and sometimes human-made noises. Both male and female can mimic the sound of predatory birds. The male performs these calls at the bower, whereas the female vocalizes at the nest if she is threatened or disturbed. A female satin bowerbird holds a tasty grub in her beak. All bowerbirds are frugivores, living mainly on the fruits of trees and bushes; occasionally, they eat insects, spiders, and seeds. Since tree fruits are abundant most of the year, and it is a high energy food source, a fruit diet gives the male plenty of time to build his bower. At the San Diego Zoo, the bowerbirds are fed an assortment of fruit and low-iron pellets. Living in a mixed-species aviary means they also have access to a variety of choices offered to their exhibit mates. Bower power. Male bowerbirds are famous for creating complicated bowers that are used for display during the mating ritual. These bowers can take many forms, with each type of bower particular to the species but also special to the individual male and his available resources. 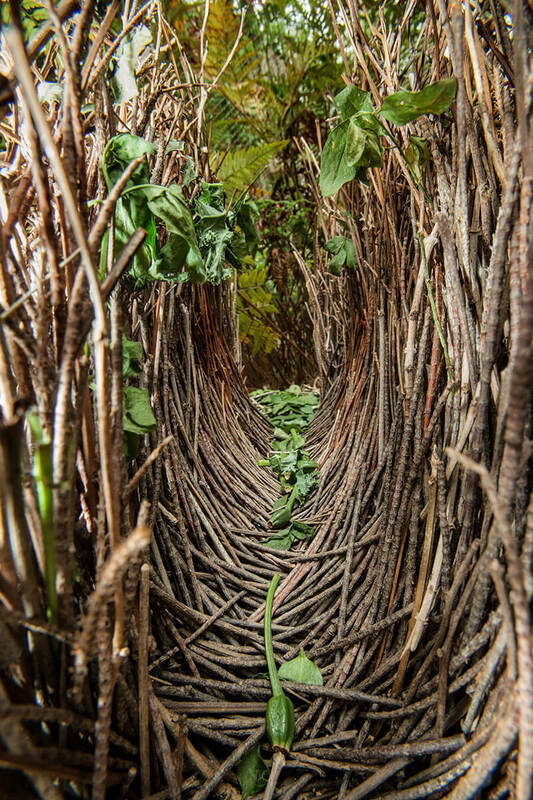 There are three main types of bower architecture: a cleared area containing an “avenue” or domed tunnel of sticks, just wide enough for a bowerbird to pass through and sometimes painted with vegetable juices; a “display court” with large leaves laid upside down or tiled with rocks; and a “maypole,” which uses a sapling as a central tower, with an assortment of vegetation packed around the base, with or without a roof, sometimes many feet tall. A male may spend a week to two months getting his bower in order, depending on whether he is refurbishing a previously used structure or building a new one. Some bowers built by male satin bowerbirds have been maintained for more than 30 years, and both males and females of this species are known to live 20 to 30 years. Avian artists. Once the bower is complete, the male adds decorative touches using everything and anything he can find and carry: seeds, pebbles, snail shells, berries, ferns, lichens, dead beetles, fresh flowers, spider webbing, bones, leaves, even bits of glass, cloth, plastic, aluminum foil, and other items discarded by humans. Different species favor different colors. For example, the striped gardener bowerbird prefers yellow, red, and blue objects. 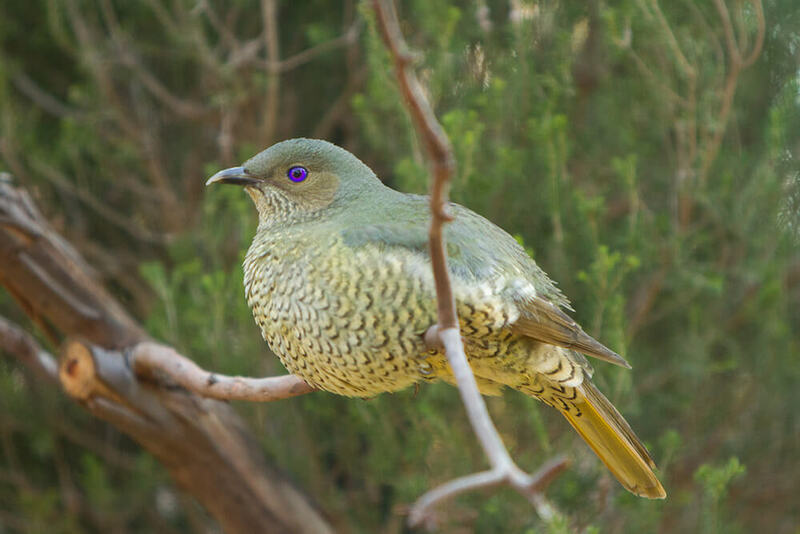 The fawn-breasted bowerbird favors green. Males of some species also “paint” their walls with a mixture of charcoal dust and saliva or plant juices. The bird uses his beak or a bit of chewed bark as a paintbrush. The male continuously defends his bower, rearranging baubles he has used to decorate the area, collecting fresh replacements, dabbing a little touch-up paint on the walls, and hovering over his masterpiece. When not inside his bower, the male may perch a few feet above it and watch for an eligible female or an intruding male that may try to destroy his bower. If a female is enticed by the architecture, she will visit the male, be entertained by a song or dance on his stage or court, and decide if he is worthy. Bowers are not nests. After the male dances, sings, and grovels along the ground, seemingly begging a female to accept him, they mate, and the female usually leaves. If she lingers, the male may drive her out so he can tidy up his bower and prepare for the next song-and-dance routine used to attract yet another mate. After mating, the female builds a cup-shaped nest in a higher, more secluded location in a bush or a tree hole. She builds the nest alone, also being solely responsible for laying eggs, incubating, and feeding the young. Laying a clutch of 1 to 3 eggs, depending on the species, she incubates them for 12 to 15 days. The eggs are strikingly marked by scribbly lines of brown, gray, purple, and black, as if an artist had dribbled ink on them. These patterns probably help to camouflage the eggs. From hatch to fledge takes about three weeks, and most mother bowerbirds carry out all the nesting duties solo. The mother has no difficulty feeding herself and her offspring, possibly caring for them for two to three months before the young go off on their own. The white-eared, black-eared, and green catbird species are different: the male helps feed the chicks. The San Diego Zoo’s first bowerbirds, a pair of satin bowerbirds, arrived from the Taronga Zoo in Australia in 1927. Since then, we’ve also had regent, spotted, and great gray bowerbirds in our collection. We currently have fawn-breasted bowerbirds in our Owens Aviary and Parker Aviary. Each male strips off fern leaves and uses the sticks to build his avenue-style bower. Fawn-breasted bowerbirds are also in the Zoo’s new Australian Outback exhibit, where you will find them in the aviary closest to the Marsupial Wall. There are no ferns in that aviary, so keepers collect the fern stalks from other areas of the Zoo and place them in the aviary for the bower builder’s use. There are challenges to bowerbirds in the wild, though their numbers are mostly stable. Potential reasons for their decline include predation by feral cats or red foxes, fragmentation and degradation of habitat by agriculture or grazing, and potential illegal shooting or poisoning, since occasionally they are seen as pests. Legislation currently protects bowerbirds and their habitats, while research, public awareness, and monitoring continue to ensure their stability. You can help us bring other bird species back from the brink by supporting the San Diego Zoo Global Wildlife Conservancy. Together we can save and protect wildlife around the globe. Female bowerbirds are attracted to bowers with lots of fruit, but when the fruit shrivels, the male discards it nearby, in effect planting more fruit-bearing plants, the first instance of a non-human species propagating plants for use other than food. 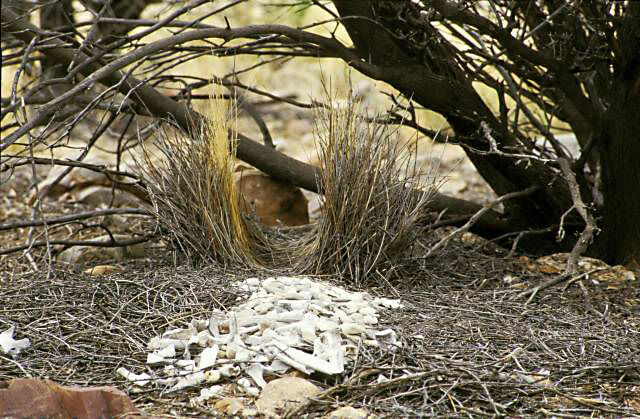 The dullest-colored bowerbird males build the most elaborate bowers. 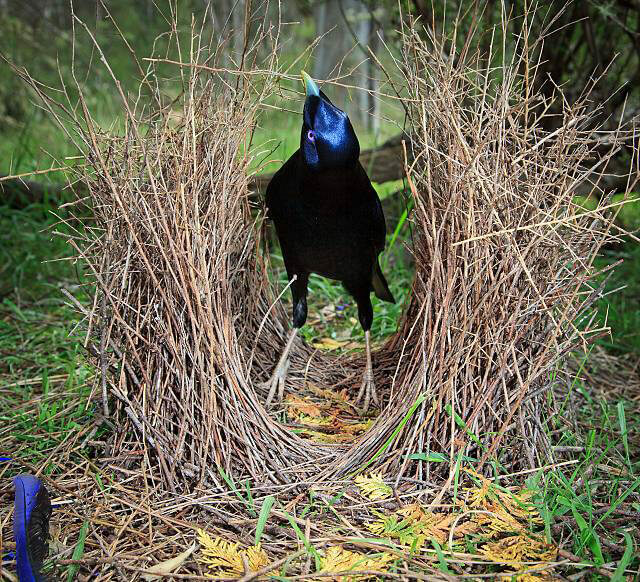 The drab Vogelkop gardener bowerbird builds one of the largest and most elaborately decorated of all bowers: a hutlike structure, 5 feet high and over 6 feet in diameter. Anting, which involves the use of live ants to anoint feathers, is rarely observed with wild birds, but tooth-billed, golden, and satin bowerbirds have been recorded doing this. Nineteenth-century European naturalists thought bowers were constructed by humans rather than bowerbirds. 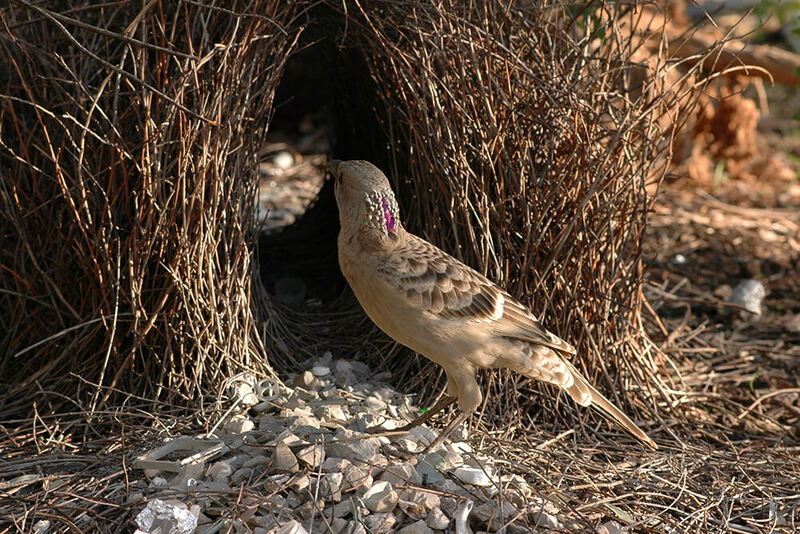 Some male bowerbirds have been known to build 9-foot-tall (2.7 meters) teepeelike structures as their bower. The Perth Mint of Australia has created a series of five silver coins in its Birds of Australia series. The regent bowerbird is one of the birds selected.